This page is not a review of any single Ramen Jiro branch, but rather an overall beginner's guide to Ramen Jiro for the Tokyo ramen novice. Ramen Jiro is of course technically ramen, but it is somewhat different from any other ramen in Japan. It is tonkotsu broth with shoyu added, but the broth is more like a thinner (but very rich) pork gravy and in most branches it has a large amount of suspended fat (abura). The noodles are (typically) very thick and chewy but not quite as eggy or yellow as regular ramen noodles, and many of the branches make their own, if you see a big green or blue machine that looks like a weaving loom and has flour all over it somewhere in the shop, that's what they make them with. The pork is a very rough cut, usually from the tenderloin but sometimes from some less recognizable part of the pig, and occasionally will be mostly fat. The veggies are usually cabbage or moyashi (bean sprouts), and each branch has its own ratio of the two. Add to this a large amount of chopped garlic (if you want it), usually fresh but not always, and then a few individual stores have optional toppings such as eggs (raw/"nama", 生 or boiled/yude, ゆで), cheese, curry or extra fat from the soup pot, and then curry powder or black pepper on the counter. Many Jiros do not have tissues to wipe your mouth with, or spoons for the broth. Ramen Jiro is certainly not for those who are health conscious, and those of weaker constitutions can feel a bit queasy after eating there for the first time, especially if they force themselves to finish the whole bowl. The general recommendation that I have heard from Ramen Jiro customers is that on the day you go to Ramen Jiro, you should eat a pear ("nashi" or 梨 in Japanese) for breakfast or lunch that day, and nothing else. If you can't find a pear then perhaps an apple. My personal advice is that you should not force yourself to finish the bowl, this business about ramen shop chefs getting insulted when you leave some soup in your bowl is generally not true, I'm sure they would prefer to get "insulted" by you leaving some in your bowl rather than get insulted by you getting sick all over their shop floor. Also a yogurt drink, available from any conbini, helps soothe the stomach afterwards. The overall taste is not like any other ramen available in Japan. It's hard to explain on paper or to understand how the flavors all come together without actually tasting it. Ramen Jiro has achieved something of a cult status in Japan, especially among young men - there's only been one or two times out of the 40-50 times I've visited Ramen Jiro branches that there has not been a line of at least 5-10 people (sometimes more than 30) waiting to get in, and 95% of the customers are men (admittedly a non-scientific survey at best). Lines typically start to form 30 minutes or so before each store opens. 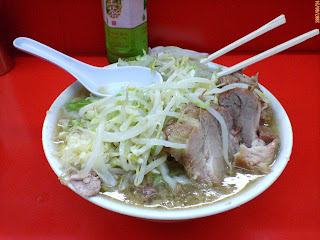 There is no talking or lingering at Ramen Jiro branches, just eating. Generally I find that a good rule of thumb is that each person on line means on average a 3 minute wait, e.g. 10 people on line in front of you means 30 minutes before you can sit down. Then it may be another 5-10 mins before you actually have a bowl in front of you. As of this writing (January 2010), there are 33 Jiro branches in Tokyo and the surrounding areas of Yokohama, Chiba, Ibaraki and Tochigi. Most of them are in Tokyo. There are no other Jiro branches in any other regions AFAIK. I have eaten at 32 of them and I plan to finish all of them by early next year. Some of them are in more remote areas of Tokyo (1-1.5 hours from the Yamanote-sen train loop and then some walking) so it's not always easy to get to them, especially when you have a real day job. I believe Ramen Jiro is more like a franchise than a chain. The original store is the Mita Hon Ten 三田本店, from which almost all of today's Ramen Jiros are descended, typically by a staff member who goes on to start his own shop. I am currently researching the lineage of the different stores and will update this page when I have more info. Obviously all of these sites require some Japanese language reading ability in order to fully understand them. However I linked to them here since you should be able to at least use them to figure out where the Jiro locations are and whether you like how they serve it (based on the pictures). Show the maps to a Japanese friend or the concierge at your hotel and they can help you. A couple of the sites have translation links on them, and you could try BabelFish or Google Translate. It's getting better but in general, automated language translation of websites leaves something to be desired. http://www.youtube.com/watch?v=iApq0GSLCG4&eurl=http%3A%2F%2Fdabble%2Ecom%2Fnode%2F11761217 (this link is dead and I am looking for the video someplace else, meanwhile try this one. OK, So I Want To Eat At Ramen Jiro, What Do I Do? 1) Figure out which Ramen Jiro you want to eat at. Use the Otaqe's links above to see which one is near your hotel or wherever it is you are staying. I'll be adding a system soon whereby you can see what ramen shops are in what areas, or are near a given hotel. You can print out the page from the above link and show it to a Japanese friend or to the concierge. 2) My recommendations for the first time Ramen Jiro customer are Ikebukero and Shinjuku, these two are more or less on the Yamanote-sen loop line and have other overall positive qualities that make them good choices for first-timers. 3) Figure out when your desired store is open, again using the links above. The grey, blue and orange columns are the days of the week from Monday through Sunday, with the second orange column being national holidays. This symbol 休 means "vacation" or "closed that day". Note that many Ramen Jiro locations are closed at least one day a week, and also many of them are closed for a period in mid-afternoon. Also keep in mind that these Ramen Jiro shops are sometimes informal affairs, meaning they occasionally may open 1/2 hour late, or close 1/2 hour early if they run out of soup or noodles, typically without warning. 4) Make sure that you have 1000 yen notes or plenty of coins for the ticket vending machine, usually the older machines in many of these places do not take larger size notes such as 2000, 5000 or 10000 yen. The guys behind the counter will usually make change if you want but it's best to be prepared. 5) Go there. There are various sites devoted to helping foreigners get around Tokyo, Google for "Tokyo train maps" or "getting around Tokyo" and similar phrases. The Jorudan English site is good for figuring out what trains go from station A to station B. 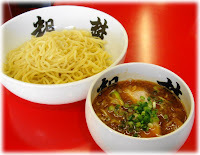 In conjunction with the Google Maps links that I provide for each Ramen Jiro review, or the Livedoor maps that are on the above Japanese site, you should be able to navigate to the closest train station, then use the maps to get to the Ramen Jiro shop. You should be able to show the maps to any taxi driver once you get out of the station or walk if it's close enough, the majority of them are within 10 mins walk of the station. 1) Scope out the line and make a decision as to whether you are going to wait or not. Keep in mind what time the shop closes. Remember some Ramen Jiros may not have restrooms. 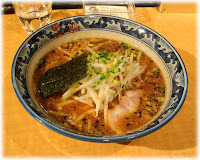 2) Many Ramen Jiro branches do not have tissues or napkins. Make sure you have some, such as the small packs that they hand out on the sidewalks in front of train stations. You will go through a few. Try not to blow your nose inside the store if you can help it. 3) Bring a bottle of tea or water, almost all Ramen Jiros have a soft drink dispenser outside. I recommend staying away from carbonated drinks since they will make your stomach feel full faster, and you are going to need every cubic inch of space. While all Ramen Jiros have some sort of water dispenser and cups (typically self-serve), the stores are typically cramped and getting up to refill the small cups 3 or 4 times is a PITA. 4) No smoking in the shops - smoke now if you need to. 1) While waiting on line, as you get close to the door, you should be able to see the ticket vending machine. Note where the money goes in, where the tickets and change come out, and what lever you have to hit or knob to turn to make the change come out. In some shops the ticket will be a paper one that prints out, while at others the ticket will be a plastic rectangular chip. 2) Also while waiting on line, you may be asked what size ramen you are going to order via a question "Nani? Nani?" or "Oki-sa wa?" from the guys behind the counter. Or they may make a motion for you to hold up your plastic chip (see next item). This is so that the cook can queue up the right amount of noodles on deck in the pot. This is *not* the time to say what toppings you want, that's later. The answers are either "shou" (small) or "dai" (large). The shou is enough for most people I think (I'm 6' 2" 220 lbs and I can't finish the dai). The dai is sometimes close to a gallon in volume when all of the toppings are factored in. Andy Raskin's link above covers that. 3) It's considered good form to get your ticket from the machine a few minutes before your seat opens up. Here's a picture of a ticket vending machine from the Omiya shop. The first row has the "small" or "shou" (小) ramen choices. From the left it's shou with just a piece or two of pork, then "shou buta" (more pork), "shou daburu" (double pork, sometimes it's written as "W"). Sometimes the character for pork 豚 will be used. This store also has a "mini" ramen (the green ticket) and tsukemen (the yellow ticket, most Ramen Jiro shops do not have this). The second row has the same things except in "large" or "dai" size (大). Put in the right amount of money, and then the buttons will light up as appropriate. If you see these characters on the button: 売切 or 売り切れ, then that selection is sold out. Press the button and the plastic chip or paper ticket will fall out into a tray on the machine. If you are due change then sometimes you have to turn a knob or press a button (will be labeled おつり) to get it to come out. Take your ticket and get back on line. 4) Most Ramen Jiros do not have tsukemen. Ones that do include Hachioji, Kaminoge, Shinjuku, Sagamihara. 5) Once a free seat opens up go and sit down. There won't be much room. Most Ramen Jiros and most ramen shops in general have a shelf near your legs to put your bag, purse etc. on. You may also find some manga or men's magazines there too. 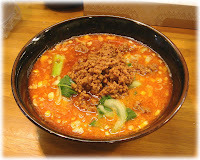 辛め　karame - means "spicy" or "with spiciness"
固め　katame - means make the noodles "al dente"
You can also say "mashi" or "mashi mashi" to get extra or extra extra of that topping, e.g. "yasai mashi mashi ninniku" = extra extra veggies, regular garlic. OR say "sukuname" (pronounced skoo-nah-may) to get only a little bit. You may also not be asked what toppings until the bowl is ready to be handed to you, if at all. 7) Grab your chopsticks. If spoons are provided, also grab one while waiting. 1) OK this is it, it's "go time!" (Remember Lloyd Bridges playing Izzy on Seinfeld?) Once the bowl comes, don't be scared by the initial size. Concentrate. Focus. This is a marathon, not a sprint. 2) You will probably have to take the bowl down from the upper counter and place it in front of you. Be careful - it is full and hot, and probably slippery. 3) Don't put your face directly above the bowl if you can help it - the steam will affect your comfort level and ability to eat. 4) If spoons were provided, before starting to eat, try to ladle some of the broth over the veggies and noodles and pork that were placed on top. This will help bring everything up to an even temperature. 5) Dig in. My recommendation is to start with moyashi and noodles, just to start making progress. Then alternating with pork if you ordered it. I find that saving a couple of pieces of pork for last works well. 6) Some of the pork pieces will sometimes have large sections of fat. I recommend that you do not eat these, and just eat as much meat as you can off the piece. It's OK to leave these fatty bits in your bowl. 7) Due to the fact that it frequently has so much suspended fat, I also leave some of my soup in the bowl, along with any chunks of fat from the pork pieces. 8) If you start to feel full, slow down for a bit, take a breath, drink some liquid. If Takeru Kobayashi can eat 63 Nathan's hot dogs in 12 minutes, then you can eat one bowl of ramen. 9) BUT DON'T FORCE YOURSELF. Getting sick on the floor of the shop will not enhance the reputation of foreigners in Tokyo in any way, shape or form. I actually know that some Ramen Jiro proprietors will tell customers not to force themselves to finish the bowl if they sense that they are having trouble. 1) These things are more Ramen Jiro etiquette than anything else, it's not like someone is going to chase after you if you don't do this. When you are done, put your bowl and glass on the upper counter. You will usually see a damp washcloth on the counter, take it and wipe down the counter in front of you. Take all of your stuff with you, including anything that you put on the shelf under the counter. 2) The official phrase that you will hear most customers say as they leave is "gochiso sama" or "gochiso sama deshita", meaning "I am a satisfied customer, thank you for the meal". Assuming that you are actually satisfied then if you want to say it then say it, it's part of the custom or ramen shops in general and the customers I've seen seem to do it fairly regularly. If you don't want to then you don't have to. 3) If your stomach is bothering you after leaving the store then get a milk or yogurt at the nearest conbini. Click the link under "Shop Address (Japanese)" in the below table, or paste the text into Google Maps, to bring up a Google Map of the location.